19 Jun – Photos uploaded. 19 May – The send-off. 24 Apr – Appeal final date. 22 Apr – Imporant update notice. 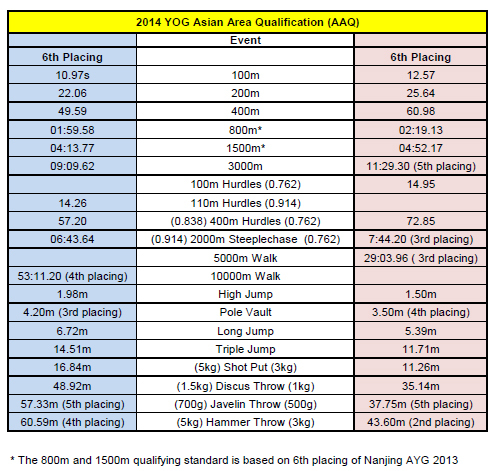 10 Jan – Team Singapore selection criteria. 10 Jan – Page created. Age limit: The age of the athletes taking part in the Youth Athletics Championships has to be born in 1997 and 1998 (For 16-17 years old as of Dec 2014). View Team Singapore results here. Please note that an athlete may only compete in one individual event plus the Mixed Relay. Track Events: qualification for the next round would be based on IAAF Rule 166. 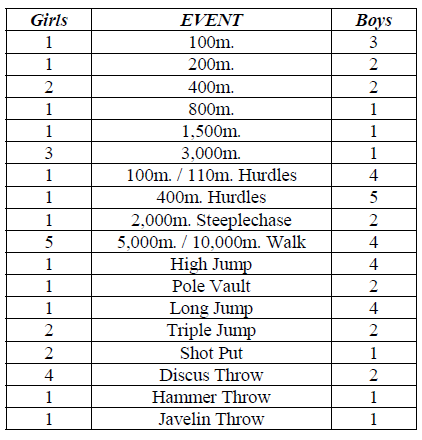 Field Events: qualifying rounds may be held depending on the number of participants in each field event. Qualification standards will be announced at the Technical Meeting. Singapore athletes who met the qualifying mark as of 24th April. AAQ YOG (Thailand) Pole vault men 4.20m 4.38m Huan, Jun Kai, Dylan SSP 17 Nantou Int.